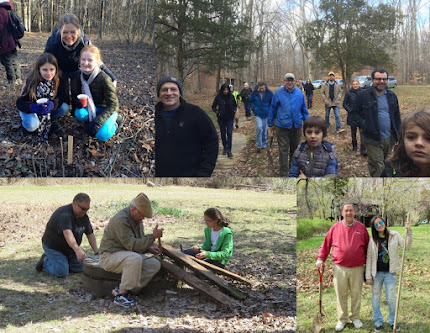 Thanks to Girl Scout Troop 72905 from the Princeton Service Unit, led by Pallavi Nuka, for joining us for a workday at Herrontown Woods. The girls worked together to clear brush and cut invasive vines in an area of the preserve that will be planted with native wildflowers and shrubs that cater to the needs of pollinators in summer. Dense forests have few flowers in summer, but this area near the parking lot was a pine grove decimated by wind and ice storms, creating sunny openings for habitat that will complement the surrounding forest. Workdays are a great chance to work cooperatively and learn how to use a saw or a pair of loppers safely and effectively. The kids and parents brought a lot of positive energy and capability, and got a tremendous amount done. Afterwards, we went on a walk to see some of Herrontown Woods and show them where Oswald Veblen once lived, the renowned mathematician and colleague of Einstein. Veblen loved to clear brush, and would involve fellow faculty at the Institute for Advanced Study in the enterprise. He and his wife Elizabeth donated all this land back in 1957 for us to care for and enjoy.